We all know the value of a good headline — it’s often the first thing readers see and, in a Web centric world, well written, intriguing headlines are key to grabbing people’s attention, especially on social media. The result, however, has been some headlines that are really more about getting someone to click or link to the story for SEO purposes. So, here’s the question: Can you tell the difference between actual headlines that media outlets used to lure in clicks and totally over-the-top fakes? 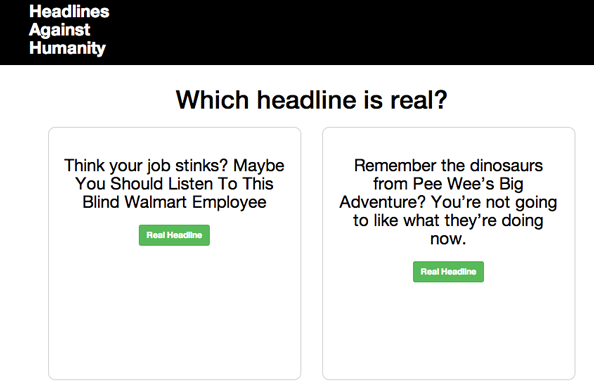 Well, you can test your skills at Headlines Against Humanity (and submit your own). The site, which recently launched, pits two headlines against each other and asks which is real. If you’re right you’ll be treated to a congratulations message and even a link to the story. Perhaps surprisingly, the headlines don’t all come from Buzzfeed (or similar sites). Check out the site and play the game here.